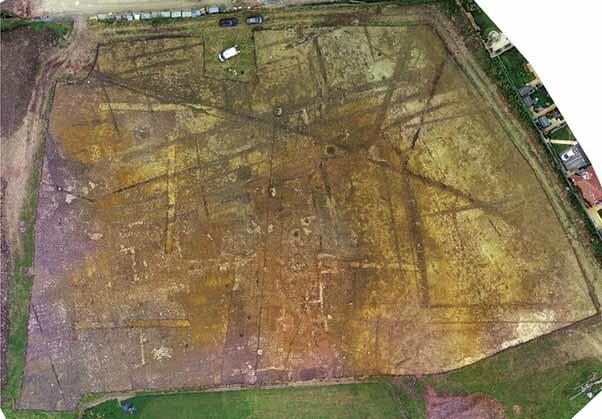 In 2016 Cotswold Archaeology carried out an excavation at Lockleaze, South Gloucestershire, prior to the residential development of the site by Redrow Homes. They had a team of 30 archaeologists for several months. The side was previously unknown and was under a rugby club practice pitch. Redrow funded the excavation and the post-excavation analyses. Paul Driscoll of S. Glos C.C. monitored the work. To uncover an entire villa complex is unusual. There are only three others in the Bristol area: Kingsweston; Brislington and Emerson’s Green. For this talk the findings are preliminary, prior to a future monograph. In 2014 the site was identified by a geophysical survey, when planning permission was dependent upon the archaeological potential of the area. Linear features showed in the NW corner of the site. A desk based assessment identified archaeology in the area. 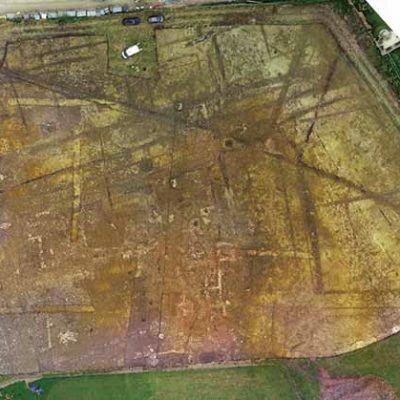 For the evaluation, 9 trial trenches were dug and they revealed boundary ditches, pits and enclosures from the Roman and possibly Iron Age periods. A substantial wall was revealed and as a result a full archaeological excavation took place covering 1.2 ha. In July 2016, the topsoil was stripped. Drone imagery geo-referenced the images. A lot of demolition had taken place over the whole site, and this together with later ploughing masked many of the walls. The excavation began with 2m2 trial pits to evaluate the archaeology to decide whether they could strip more with a machine. They could, but not on the walls and these were trowelled by hand. In one pit 51 coins from the late 3rd Century AD were found. From August to November 2016 the site was worked by hand. The earliest feature was a late Iron Age enclosure with a roundhouse inside. The roundhouse had internal postholes. Late Iron Age – 1st Century AD pottery and animal bone came from this area, with the 2nd Century being the latest date. This area had been preceded by fields and enclosures and two droveways. The ditches dated to 1st – 2nd Centuries AD. Occupation of the site continued up to the 4th Century AD. In the north area of the site was a grave in a NW/SE orientation. It was 2.15m long. The skeleton was supine and had hobnails at it feet. No cemetery was found associated with the complex and only one other burial (cremation) was found. An earlier, timber structure was uncovered with beam slots. The finds are dated 2nd – 3rd Centuries AD. 40m south of the timber building were two ditches either side of it, 1m wide. They had a 2nd Century date. Built over it was a stone structure, rectangular in shape with a substantial ditch that marks the western boundary. The ditch had been re-cut in places. This area had been re-modelled in the later Roman period with a walled courtyard, ancillary buildings and a substantial stone structure that had three major phases. There are finds of pottery, but the walls were robbed out in the Medieval period. The main house was rectangular in shape measuring 19m x 7m with three internal divisions. North and south wings were added at a later date. The north wing with an extension, measured 21m x 6m and included a kitchen, slabbed floor that was covered in charcoal and animal bone and had pottery of the 4th Century. A square hearth and a bread oven was also discovered. The north wing extension was curved inside, with pink plaster. There were drains in this wing. The south wing was a single room 16m wide (probably a winter dining room) heated by a hypocaust. Also uncovered were the remains of a furnace. This had a slab base covered with charcoal. The excavators could see how the hypocaust was constructed and used and how the hot air was channelled around the building. The walled courtyard was added to this building measuring 32m x 30m which probably had a formal garden inside. A later construction was a portico and a range of rooms that were added. The portico was 3m wide and open at the front. The house and complex was now at its maximum extent. Another hypocaust was found in the south wing made of pennant sandstone. All the roof tiles were pennant sandstone, from a local source. Throughout the site, all the walls were ‘dissected’ by hand to see the building techniques and the mortar. Four wells were uncovered: two in the north wing beyond the kitchen. Construction restraints only allowed excavation to 1m depth. They are dated to 3rd – 4th Centuries AD. In the NW corner was a rectangular ancillary building 26m x 20m. There was also a tank/cistern 3.5m x 1.17m and 90cm deep. It was dug down to the clay. It had trapezoidal openings in two of the walls to control the water. Evidence of lead weights were found in the SW corner of the site, found by a metal detectorist (used in a controlled situation over the site). Only the lead waste was found and no evidence of where it was worked. An aisled barn was uncovered with walls and substantial postholes. There was a series of flues in the eastern corner of the barn with a tank-like feature 25cm deep with pennant sandstone slabs in the bottom. All the roof tiles had fallen in. The finds include a lead-bronze lamp of a seated figure dated to the 1st Century AD; Alexandrian and incomplete. More than 300 coins from 2nd to late 3rd and 4th Centuries AD. A bronze mount of a lion’s head 1st – 2nd Centuries AD. Brooches include Hod Hill type with a bow and a coiled pin, mid-1st Century AD and ‘T’ shaped forms. A round enamelled plate brooch 2nd – 3rd Centuries AD with Celtic inspired design. A bronze finger ring and a small iron mattock and pointing trowel. This was an interesting and exciting talk of a large villa complex that was hitherto completely unknown. The results will be published in a monograph when all the post-ex analyses are complete. Redrow will donate all the finds to Bristol Museum and Art Gallery.